Indian fast food that's really fast but isn't cafeteria style? Served in fancy-shmancy minimalist china and is actually tasty? With decent prices and a lot of food for the money? And a snazzy website to boot? Does it exist? Yes! 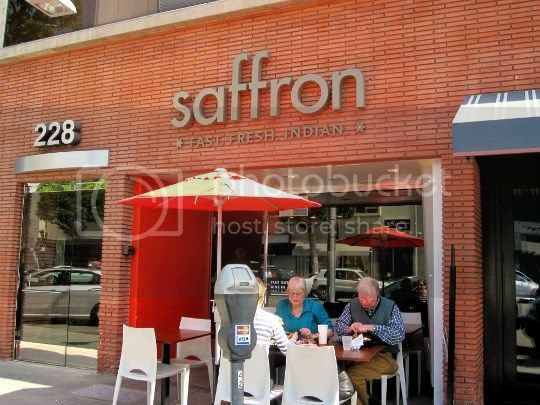 "Fast, fresh, Indian" restaurant Saffron delivers just that: quick and satisfying food in a modern setting. The small brick storefront of the Beverly Hills location (there's another one in Downtown LA) is almost hard to miss. The thin, slight font of the restaurant's logo is a pale gray, which can be a bit hard to see in bright sunlight. A few dining tables sit outside, which come a little too close for comfort to the sidewalk's passers-by. There's plenty of metered street parking (well, it's Beverly Hills, so I guess that depends on the time of day) and lots, and they're open until 10 every day (late night Indian, yes!). 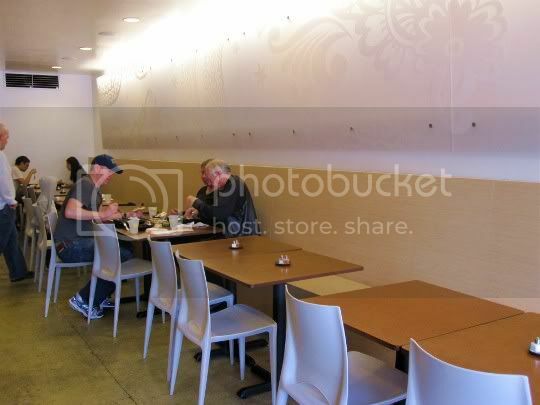 The interior of Saffron is small, but clean, minimalist, and straight to the point. You almost have no choice but to follow the rich red-orange wall to the left to place your order, with a large, easy-to-read menu posted above. Saffron's pricing is as follows: $7.95 for a combo plate of two items plus rice or salad, or $5.95 for a bowl of one item plus rice. For the combo plate, I think you have to specify if you want the salad. I got rice (and a LOT of it, almost too much for the entree amounts) without being asked for my preferred option. In the end, I think I almost would have preferred the salad plus an order of naan ('cause you know, still gotta have the carbs). To the right sits the well-lit, white and birch dining area, along with drink station and chutney bar (holy samosa, a chutney bar!). It's sort of like upscale fast-food, if fast-food were upscale. But believe me when I say the food is fast, as mine came out probably less than five minutes after I placed my order. Mint: Perfectly seasoned, nice consistency, very herbal and pungent, full of mint and chile flavor. Mango: Very jam-like in consistency, wine/alcohol/vinegary/fermented flavor, a few scattered chunks of fruit here and there, a bit salty, decent flavor. Tamarind: Tangy and sweet, fruity and fresh (my favorite!). Mmmm, I love me some samosas...and these don't fail. 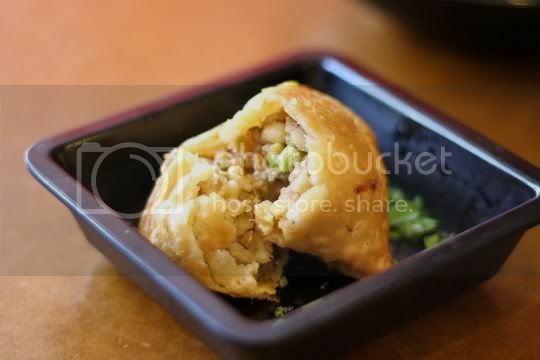 The potato and pea filling is well seasoned, spicy, and pungent, albeit a little on the salty side. The dough is crisp and not overly greasy, which is definitely important for these Indian treats! The filling was piping hot, which I'm taking as a sign they were freshly fried and not sitting around under a heat lamp. 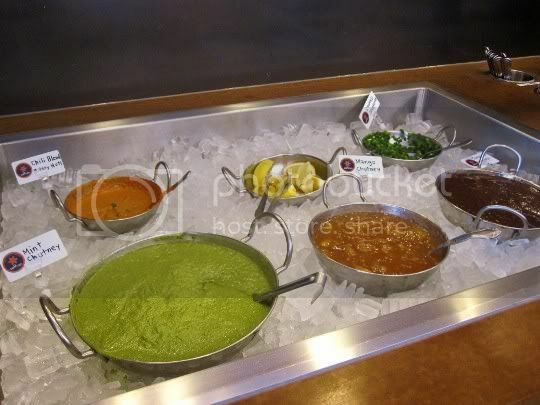 The samosa is absolutely delicious with all three of the chutneys. I was surprised at the mild flavor of this dish. In fact, I'd go so far as to say it's a bit bland. The cooked-til-it's-falling-apart blend of spinach, garlic, and ginger is also very buttery and rich; I'm not sure if that's from a mass of added ghee, or the seepage of the paneer chunks. Oh, and I only had four of those; a couple more would have been nice. I'm not a huge fan of cauliflower, but it's not my dislike of it that made me dislike this dish. 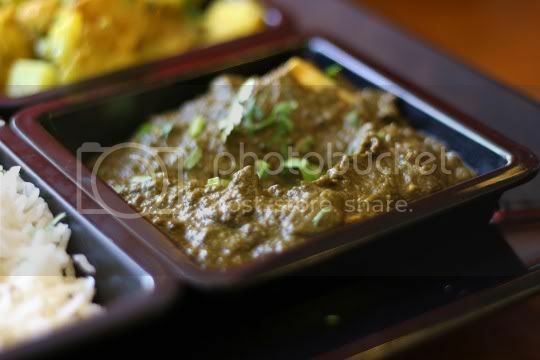 Again, like with the saag paneer, it's too bland. It does seem to have more flavor than the aforementioned, but the gravy isn't rich, thick, and salty like I'd expect. The combo of cauliflower and potatoes are more "lightly tossed" in the sauce. The veggies, however, are perfectly cooked, and there is a bit of nice sweetness from the cauliflower. Something about this version of the tomato-based chickpea dish doesn't taste entirely authentic. I couldn't quite put my finger on it, but it could have something to do with the huge amount of rice in the bowl. My theory is that the rice sucked up all of the yummy masala sauce, not leaving enough to drench the chickpeas in. More sauce, Saffron, more sauce! That being said, the sauce I could taste is super peppery (in a good way) that gives a nice amount of heat, although there isn't really enough of the traditional tomato tanginess. 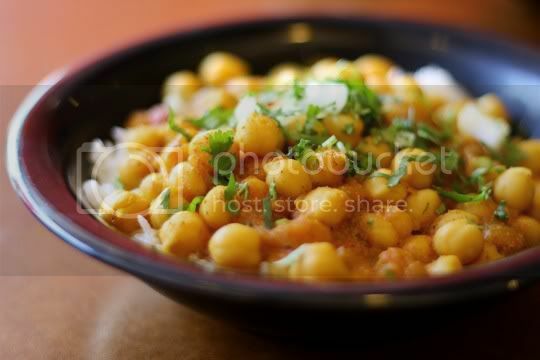 But it also has a nice richness that emphasizes the natural buttery flavor of the chickpeas. Would I order it again? Meh, maybe. Winner winner, tofu dinner! 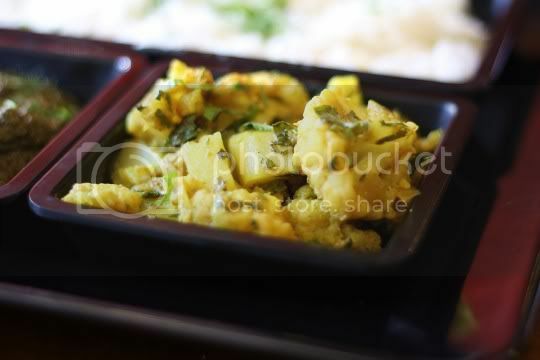 Okay Saffron, we've got a DEFINITE favorite here with this DELICIOUS dish. This is by far the best of the vegetarian offerings; I was trying NOT to eat it just so I could savor it later. The sauce is rich and thick, tomatoey, sweet and pungent. I thought it could use a bit more salt, but I was surprised at how comfort-food this tasted. There's enough tofu to keep me happy, along with soft stewed chunks of onion and green bell pepper. And get this, there's enough of that amazing sauce to perfectly drench the rice...yum! Okay so aside from my bit of complaining about some of the bland dishes...I'm gonna take it all back. Well not really, but let's just say the next day's leftovers were suddenly amazing and full of flavor. Maybe this is just one of those places where the food is SO fresh, it needs a day to sit and stew? You know, like a good chili or marinara sauce? Hey, it's possible. 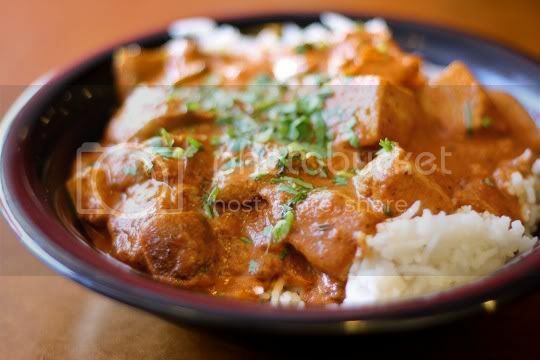 And I'd go back to Saffron any day, looking forward to a fabulous meal of leftovers (except for that delicious Tofu Tikka Masala, which won't last long the next time! ).